Oysters Rockefeller is named for one of the most elite New Yorkers of all time, but it was created by another ex-resident of the Big Apple. Like Twain, Antoine Alciatore made his name after he left the East Coast, frustrated by years of trying and failing to start a restaurant of his own. He hit the jackpot in New Orleans, founding Antoine’s in 1840. It’s now the oldest operating family restaurant in the country. 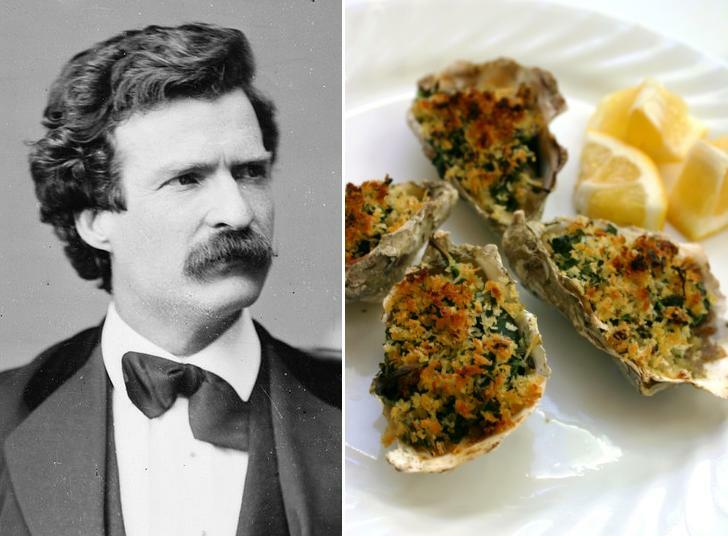 Twain hoped for “oysters roasted in the shell” upon his return to the States, and he probably could have scarfed down a dozen of these after his travels. Although I shared mine, I can attest that a platter of them is an ideal way to unwind after a long trip—or just a long day. 1. Preheat oven to 450°F. Melt butter in a skillet over medium heat. Saute garlic for 2 minutes, then remove from heat. In a small bowl, combine bread crumbs with half the garlic butter. Add olive oil, parmesan and parsley, toss to mix, then set aside. 2. To the remaining garlic butter in the skillet, add shallots and spinach. Cook for 3 minutes over low heat until the spinach wilts. Add Pernod and season with salt and pepper, then allow the mixture to cook down for a few minutes. 3. Spoon 1 heaping teaspoon of the spinach mixture on each oyster followed by a spoonful of the bread crumbs. Bake for 10 to 12 minutes until golden. Serve with lemon wedges. There is something wonderful about Oysters in general. You doing this took them to a higher power. You tell us a wonderful story here, drawing the food line between Mr. Twain and yourself – you both seem to have excellent taste! Love your work. I’ll be cooking these real soon. I totally dig Twain. He and Huck and the others. Great writer. Wish more young people would dig him. I was just in New Orleans for Jazz Fest and went to Antoine’s! They sold us on trying the original Oysters Rockefeller. It was definitely… an experience. Your oysters look delicious! wow! That sounds so good! Although I have never been a fan of raw oysters – yours sound absolutely delectable. I just might try these! This was a beautiful and unique way to introduce a recipe. Ohhhh my gosh! Panko on oysters!! Brilliant. I must try this! I looove panko and ouster!! Excellent post. i would be try in some time..
That looks very appealing, I will definitely try this recipe. I found your blog through Freshly Pressed (congratulations) and love the whole concept. Have you read a book by the late great cookery writer Jane Grigson (UK) called ‘Food with the Famous’ it was published way back in 1981 but 2nd hand copies are not hard to come by (try Omnivore Books in SF). She covers the food eaten/mentioned by a whole range of famous people and gives recipes too;Jane Austen, Emile Zola, Claude Monet, Thomas Jefferson; and thats just the ones I can remember. I can feel the oysters melt in my mouth just by looking at your photos! 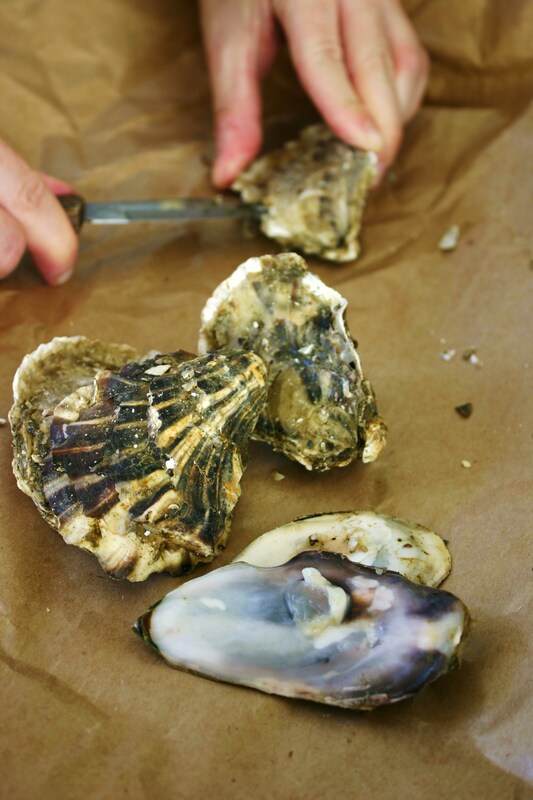 Fascinating post – I’ve always wanted to try oysters! I love the linking of food and writing. Books often use food. Always nice to do it the other way round and end up with something good to eat. Excellent post. Food and a story!! Unbeatable combination! I love it. I have got to try these, I have to drive 45 minutes for good, fresh oysters but this looks like it would be worth it! a literary delight. yummy post. These are just gorgeous and the recipe is wonderful! I thoroughly enjoyed reading your post! Thank you. Great piece and photos! Oysters are one of the ocean’s great gifts – fresh or cooked. They stand up well on their own, but also come alive with the right garnishing and pairings. I’ll have to try this in my own kitchen. I love posts like this! Please do more, with trader joes too please! 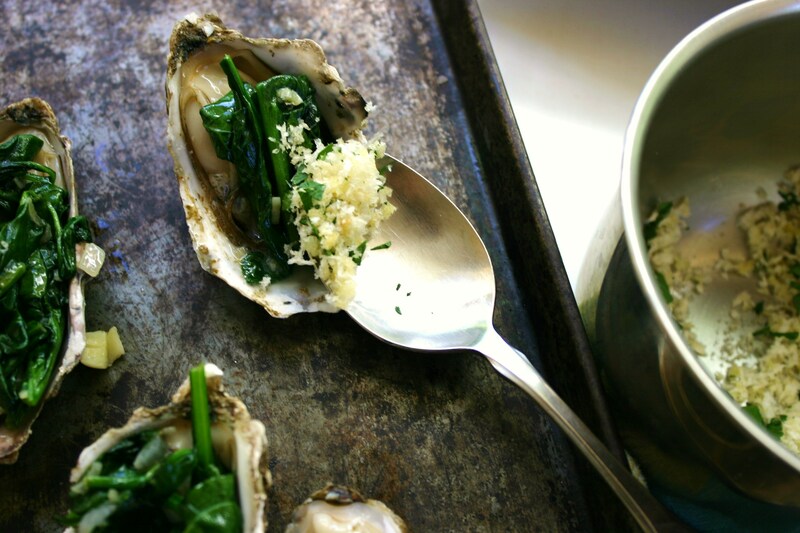 Pingback: Mark Twain: Oysters Rockefeller | What's up with T Bone Lai?